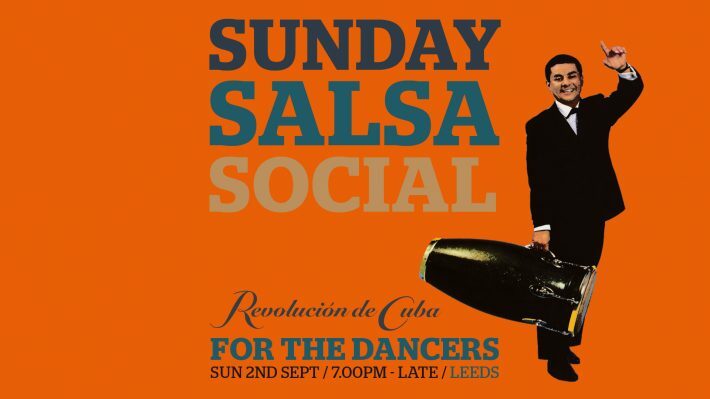 The second Sunday Salsa Social at Revolucion De Cuba Leeds is Sunday 2nd September 2018. After the huge success of the debut “Sunday Salsa Social” at Revolucion De Cuba Leeds in July, we’re going to do it again in early September. The response to the first party from you dancers was fantastic. Around 170 attended which for a Sunday salsa session is pretty amazing. Actually, that’s more than most weekend Friday and Saturday salsa parties manage to pull in! Us two DJs, Lubi and Fabio Bahia, had a lot of fun and it was nice that our friend and fellow Calle Ocho/Revolucion De Cuba DJ Jane Salsaldi jumped on the decks too. The whole vibe was very relaxed and summery with people dancing in shorts and flip-flops 🙂 Let’s keep it like this each time….nice and chilled, good music and dancing and nice food and cocktails. So, we’re back Sunday 2nd September. Once again, same timings of 7pm-12 midnight. Same DJs – Lubi and Fabio. Same price – just £3. Same music policy – just good music that includes past and present salsa, some mambo and Cuban vibes and a bit of bachata and cha cha. Stick the date in the diary, click going on the event, add some mates to it and share it and let’s pack it out again. The venue are super happy and we’ve already confirmed the next “Sunday Salsa Social” date – Sunday 30th September (5 x Sundays in September so we get to do 2 as we couldn’t do end of August due to Bank Holiday Sunday).